•	All orders placed on the World Stores website shipping to addresses in the United Kingdom will ship free of charge as long as they hit the £50 threshold. Express, overnight, and international shipping options are available directly from this retailer as well. •	Take advantage of/SALES opportunities directly from the World Sales retailer. These deals are limited in nature and very time sensitive, but offer discounts of up to 75% or more off of selected merchandise. •	Create a free email newsletter account on this site to save 15% off of your first order and receive other exclusive offers sent to your email on a weekly basis. 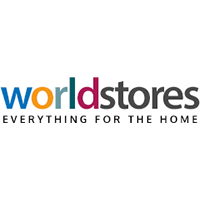 Worldstores offers everything for the home from home décor to furnishings. This UK based store offers next day delivery on most of the items in stock. Visitors can shop by style or category. There is a flash sale option that can be reached by the tab at the top of the home page. Other navigation tabs include the “discount tab” and the “top offers” tab which take users to the latest sale items. This site has a blog that discusses design tips and other tips for the home. Email registration ensures “email only” deals are delivered to the recipients email box. For most up to date offers check out WorldStores on Facebook and Twitter or contact WorldStores Support for any questions.